isn’t just a billion-gallon company that’s poised to become the largest ethanol company in the world — it’s started a corporate blog. Congrats to Poet, and thanks to South Dakota Politics for the link! It’s something what the mind races to when it cannot think. When I was in the hospital, waiting in a dark room to talk to dad again, I thought of the blog. If the terrible thing happened, should the blog’s design change? The design changed for my grandfather’s passing. Before that day this blog’s banner was a color photo of Lake Henry (outside of Scotland, South Dakota). The lake means a lot to me and meant a lot to my grandfather. What is under that lake does, too. After that death the color photo became black and white. It looked as cold as I felt. 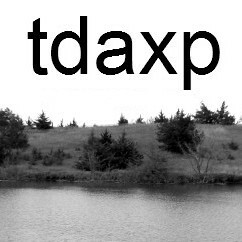 The tdaxp masthead is of the moat around the forbidden city in Beijing, China. My dad was very excited at all the photos I sent back. He was excited about China, too: trying Harben and Tsingtao beer and trying to learn some basic Chinese (my last memory of the shopping with my dad in western Sioux Falls is trying to find some Chinese-language introduction material for him). In particular, dad would shanghai anyone he could — especially guys near his age — to look at the following photo on his imac. 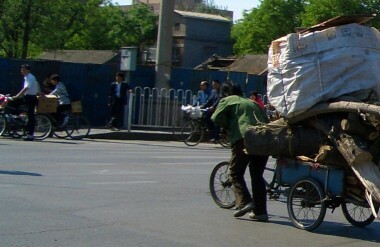 He would begin by saying how I had visited Peking and mention how the city is known for its millions of bicycles. He would show the following image, as the imac’s resolution only allowed part of the photo to be displayed at a time. Dad would then scroll right. I’ll let you view the full image to get the effect. Lake Henry is not a saline, but there is a connection between Scotland, South Dakota and the American horror writer Howard Philips Lovecraft. Lovecraft (whose fiction was excellently annotated by S.T. Joshi) and tdaxp are distant relatives. We both trace our family’s earliest arrival to America to the same ship, where are male ancestors married two Chandler sisters (one each, obviously). Lovecraft’s fiction centered on rural New England, and the towns and roads which were already dying and decaying. At that time, though, times were looking good. Though the depression was very hard, and many families lived in third-world conditions, the underlying economics of agriculture in the Midwest remained good. Densely populated countrysides created commercial centers in many small towns, creating a dense network of people, loves, and lives throughout the Central Plains. Scotland is home to one inn, recently opened. It is too young to have steady clientele yet, but my assumption is that it’s pinning it’s business on the lake. However, the new & improved (bigger and deeper) lake was not without a local cost. Old Scotland, the Eldmournholdish chalk remains of the pre-railroad settler community, now lies dead dreaming other the waves. The land was previously owned by a relative, but the city buyout and subsequent increased led to the building of a gate on that lake pasture. On the other side of the little hill, between the current gravel road and the old chalk town, lies a portion of the Yankton Trail, which connects to the territorial capital of Yankton. Over the years Scotland’s War Monument was upgraded, from a single article of war to now contain a flag, a plaque, and a fence. In my opinion the town is the worse for it. The old design put the artillery in the center, inviting children to approach and behold the scale. Still, not all is lot. The clearly political “Scotland Area Veterans Memorial” implies an attempt to get more money from the state by trying to incorporate surrounding communities, and it is this open local politics that identifies South Dakota and the United States. Scotland was once Scottish, or at least, Scotch-Irish, but no longer. Long ago the German settlers who would give Bismarck her name, on the opposite end of the Territory. Still the memory of the Stots lived on, if not accurately. The Scottish people have, for the most part, spoken English for more than a thousand years in the Lowlands. But the Highlanders receive the fame, because we lionize those who end connectivity. It was once true that “There Is A Pillar On Each End of Town.” The roofs that held the horse and car centers can mostly still be seen, and some are now used to house gardens or other simple goods. Yet as part of Janklow’s tow rejuvenization efforts the old signs were torn down, now replaced with cryptic notes that historic signs once existed here. One cannot one say in a town of memories, and leaving town to the north quickly brings one to Highway 18. Travel east along that for a bit and find Meridian Corner, an abandoned gas station and goods store on the 18 and 81 interchange. From there, head south for Yankton.